From its launch marking the 60th anniversary of the first atomic test at Maralinga in September 2016 the exhibition visited ten public galleries and museums in four states and territories were it was on display for almost 600 exhibition days. Over 110,000 visitors saw the exhibition in this period, and many more online and through the media. More than 2100 visitors attended 57 public events which included exhibition launches, curator talks and tours, artists talks, panel talks, film screenings, two forums and one expert symposium. 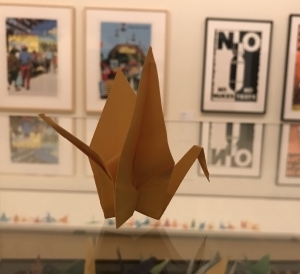 Exhibition visitors also created over 2500 origami paper cranes, with the first few hundred initially produced by the Ashburton Primary School Grade 4 students (thanks everyone!). While the statistics speak one language (and the quantitive measure says little about the exhibition visitors experience and the time spent viewing the works) the feedback we received as well as the comments in guest book and posted online draw a clear picture: many visitors were shocked to learn about a chapter of Australian history they know (next to) nothing about. The environmental and human (health) consequences shocked many, as did the fact that PM Menzies had given permission to the British single-handedly. The Aboiriginal story of dispossession, displacement and cultural disconnection is at the centre of the exhibition. Visitors were appalled, moved and sometimes brought to tears to hear about the suffering of the Anangu. Most importantly perhaps, many visitors were surprised to learn about the on-going long-lasting contamination of the land, continuous health issues affecting Aboriginal communities and nuclear veterans; the persistent and increased threat of nuclear weapons; and repeated attempts to make the Maralinga lands and other parts of Aboriginal country the location for the storage of Australia (highly radioactive) nuclear wastes. All those who have helped and contributed to tell this important story: many thanks. Your support has been much appreciated and is much valued. The BMBC team.